On his 80th outing and four and a half years since his most recent victory, 12-year-old A New Story carried teenager Adrian Heskin to victory in the Glenfarclas Cross-Country Handicap Steeplechase. Winning trainer Michael Hourigan said: “He’s not won since November 2005, but he’s kept me in the limelight by finishing placed in races like the Irish National and Becher Chase. His owners [Christy Guerin and Sean Moran from Ennis in County Clare] have owned him since he was a five-year-old and he’s taken them all around the world, so to speak. “He was placed fourth in this race last year sand third the year before, so it was always the plan to come back here again. He doesn’t like being in front, but today he didn’t seem to mind. He’s a character, a star. Hourigan’s horse beat the J P McManus-owned L’Ami, but the two men will be sharing a drink at a party tonight. Hourigan said: “J P’s won this race a few times, but it was my turn today. Asked when he realised he would win, Heskin, 17, from County Cork said: “After I crossed the line - he doesn’t do a whole lot in front! The Glanfarclas Handicap Steeple Chase provided one of the rare occasions when owner J P McManus and trainer Enda Bolger didn’t win a cross-country race. 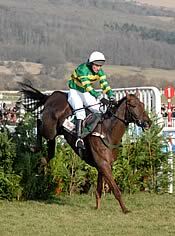 Indeed Bolger had won 13 of the 17 previous cross-country races at Cheltenham. Although providing five of the 16 starters, McManus had to settle for a best placing of second, by the Enda Bolger-trained L’Ami, who was two and a half lengths adrift of the winner A New Story. But McManus, still basking in the afterglow of his Smurfit Kappa Champion Hurdle win with Binocular, was more than happy. “We found one better than us today, but L’Ami did us proud,” he said. There were similar vibes from the Lacdoudal camp. Sarah Hobb’s, wife of trainer Philip was delighted with the performance of Lacdoudal who was two and three-quarter lengths behind L’Ami. “What a treasure he is, he doesn’t owe us anything. He’s been fantastic and Rhys [Flint] had the time of his life on him. “It was his first cross-country and he loved it. He didn’t make a mistake. He needed a turn of foot at the end and he didn’t have that. 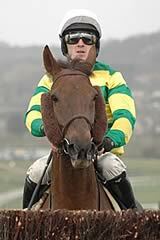 “We schooled three here the other day - Oceanos des Obeaux, Monkerhostin and Lacdoudal. Monkerhostin and Lacdoudal took to it straight away. And I’m surprised that Monkerhostin didn’t run better [he was 14th],” she said.